The first anniversary of demonetisation on Wednesday was marked by street protests by the Congress and like-minded opposition parties. NEW DELHI: The first anniversary of demonetisation on Wednesday was marked by street protests by the Congress and like-minded opposition parties against the decision which Prime Minister Narendra Modi called "a historic and multi-dimensional success" while Rahul Gandhi said it has ruined the lives of millions of hardworking Indians. The Congress, Trinamool Congress, Nationalist Congress Party, Rashtriya Janata Dal, Left parties and Aam Aadmi Party held protests in different parts of the country observing it as "Black Day", which was countered by the BJP by marking it as "Anti-Black Money Day." Union Ministers held press conferences in different parts of the country to talk about the "success" of the decision. The opposition protest came a day ahead of polling for the Himachal Pradesh assembly and about a month ahead of the Gujarat assembly polls. With opposition parties seeking to join hands against the Modi government on a range of issues, including the Goods and Services Tax, West Bengal Chief Minister and Trinamool Congress chief Mamta Banerjee called for a Common Minimum Programme (CMP) on issues of public interest so that parties with diverse political and ideological views could come together. She also claimed that around 75,000 Indian industrialists have left the country and turned NRIs post-demonetisation because of harassment and recession, leading to a Rs 7 lakh crore loss to the exchequer. Modi, in a series of tweets which also included slides and videos, bowed to the people of the country for supporting his government's measures to eradicate black money. He termed demonetisation a "decisive blow" to terrorism and Maoism." Modi said that post-demonetisation the stone-pelting incidents in the Kashmir Valley had come down by 75 per cent. 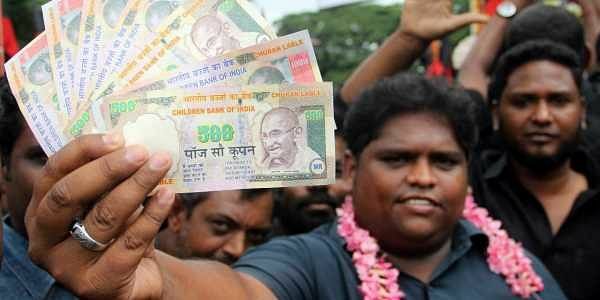 The data posted by Modi said that a miniscule percentage of India's population deposited 33 per cent of the total cash. It also said that cash deposits of Rs 3.68 lakh crore in 23.22 lakh accounts is under the scanner. It said 58,000 bank accounts of 35,000 companies were caught transacting Rs 17,000 crore after demonetisation. The slide also said that it was a "big push" towards formalisation of the economy and there had been an increase of 26.6 per cent in new taxpayers besides a significant increase in digital transactions. The Congress attack on demonetisation and GST rollout was led by party Vice President Rahul Gandhi, who targeted Modi in an article in the Financial Times. Party leader P. Chidambaram asked some probing questions through tweets while the party held a press conference at the AICC headquarters where it sought an apology from Modi and Finance Minister Arun Jaitley over the "mistake" of demonetisation. Gandhi called Modi a "democratically elected autocrat and said demonetisation has wiped out 2 per cent of India's gross domestic product, destroyed the informal labour sector and has wiped out many small and medium businesses. "It has ruined the lives of millions of hardworking Indians," he said and noted that over 1.5 million people lost their jobs in the first four months of 2017. "Modi has damaged India by converting anger created by joblessness and lack of economic opportunity into communal hatred. He has chosen to hide behind a shallow, hate-filled political narrative. Anger might have brought Modi to power but it will never create jobs or fix India's institutions," Gandhi said. Chidambaram said Jaitley had termed demonetisation as 'ethical' and then asked: "Was it ethical to heap misery on millions of people, especially 15 crore daily wage earners? Was it ethical to destroy 15 lakh regular jobs during January-April 2017?" As part of efforts to counter the protests by the opposition, Information and Broadcasting Minister Smriti Irani addressed a press conference in Lucknow, Shipping Minister Nitin Gadkari in Mumbai, Human Resource Development Minister Prakash Javadekar in Bengaluru and Defence Minister Nirmala Sitharaman in Chennai. Sitharaman alleged that all those observing a Black Day were in favour of black money while Irani targeted the Gandhi family, terming it "synonymous with graft" and said demonetisation was a tragedy for the family. Finance Minister Arun Jaitley said that demonetisation was an effort to see that people do not evade taxes and the burden is not only on the honest citizen. In Delhi, the Aam Aadmi Party held a protest march against demonetisation outside Thyagaraj Stadium while hundreds of Congress workers formed a human chain at Connaught Place. In Maharashtra, all major opposition parties, social organisations, farmer groups, mediapersons, NGOs, civil society activists and individuals organised massive protests across Mumbai and other parts of the state. The various forms of protests included processions, funerals, memorial prayers, and 'shraadh' of the spiked Rs 500 and Rs 1,000 notes, mass tonsuring of heads, human chains, besides a flood of messages, songs, cartoons and jokes on social media that castigated demonetisation. Even the ruling ally Shiv Sena organised processions in which thousands of people participated. In Bihar, the Rashtriya Janata Dal and the Congress held protests as part of 'Black Day' observance with RJD chief Lalu Prasad addressing people in Hajipur. Congress leaders also held a protest in Bengaluru.